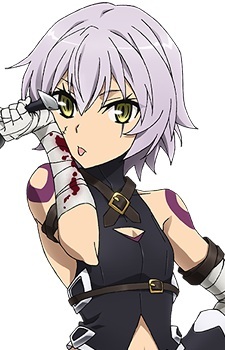 Kuro no Assassin "Jack the Ripper"
Jack the Ripper, the Legendary Serial Killer (伝説の連続殺人鬼), is a Servant of the Assassin class and one of the main characters in Fate/Apocrypha. She is a young girl who embodies contradiction itself, combining the dual natures of "day" and "night." She displays a childish manner of speech, but she is truly quick of thought. Rationality dominates her behavior, but there are many inherent weaknesses to her psyche. Her personality is both pure and cruel, and she is inclined to repay cruelty with cruelty and benevolence with benevolence. Her psyche is inherently broken, and mistreatment toward her may result in irreversible deterioration. While needing to feed on the souls of humans to keep herself in existence, she claims that she will only eat evil people because their souls "taste" better.